Lion's Mane, Hericium erinaceus (bearded tooth mushroom, satyr's beard, bearded hedgehog mushroom, pom pom mushroom, or bearded tooth fungus), is an edible mushroom belonging to the tooth fungus group. Native to North America, Europe and Asia it can be identified by its long spines (greater than 1 cm length), its appearance on hardwoods and its tendency to grow a single clump of dangling spines. In the wild, these mushrooms are common during late summer and fall on hardwoods, particularly American Beech. Hericium erinaceus contains a number of polysaccharides, such as B-glucan, heteroglucans, heteroxylans, as several cyanthane derivative triterpenes known as hericenone and erinacine. These latter compounds are found in the fruitbody and mycelium respectively. Hericium erinaceus has long a history of traditional use. As a dietary supplement, take 1000mg of Lion's Mane Mushroom Extract once daily. Where to Buy Lion's Mane Mushroom Extract? Nootropics Depot offers 30g or 60g jars of certified organic Lion's Mane Whole Fruiting Body Mushroom Extract. Nootropics Depot's Lion's Mane mushroom extract powder has been lab-tested and verified for both product purity and identity. 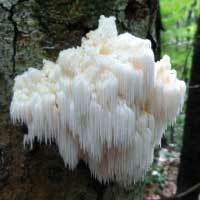 To learn more, read the Lion's Mane mushroom reviews and experiences below. Was skeptical, but definitely helped with my fatigue from another medication. Can't compare to other powders. I buy and cook this mushroom in addition to taking the powder. The mental impact has been pretty remarkable. I was a heavy coffee drinker. 500 ml to 1 L a day often. I really like coffee and also just felt the need to stay hyper focused. I have completely stopped coffee. I have a cup of tea sometimes now. Much more clarity and focus which doesn't devolve into late afternoon crashes like caffeine. I highly recommend trying this mushroom. Noots depot has the best price I can find and the product seems good. Shipping takes a while, but I'm in Thailand. I think it took about three weeks to get over here and through customs and costs $11. Lion's Mane gives a smooth boost in energy and motivation, making for positive productivity without the anxious edge that might show up with Polygala or Caffeine, for example. I initially used one dose of 500mg alongside a 100mg caffeine pill to test effects. I now use two doses of 250mg Cordyceps with 250mg Lion's Mane together with 100mg caffeine. I take this dose once in the morning and once in the afternoon, separated by about 4 hours. The effects of the Cordyceps are very similar but more or less apparent in some ways; I feel the increase in motivation and focus is stronger with Lion's Mane, but the "activation energy" and mood boost are stronger with Cordyceps. Very similar experiences but with slightly different specs. I have tried Lion's Mane on and off in the past with mixed results and decided to get back into it again with ND's product and so far I must say I'm satisfied. I've been taking ashwaghanda along with it so YMMV. I have been taking it in the morning for a bit over a week and a half at the recommended dosage and started gradually feeling the effects after 3-4 days. It seems to give a constant background energy boost but the kind you notice after the fact (no fatigue until late in the day). Dreams have been more vivid and quality of sleep deteriorated during the first few days, but now it seems to be stabilizing. Elevated mood overall. It did seem to exacerbate a mix of mania-like symptoms where I was motivated to do things but also a bit overwhelmed. However I was able to keep them under control. I'll keep on taking it and see how it goes. Shipping by ND was great and arrived quickly at the border, but it took over a week for Canada Post to get it to my address, so prepare in advance. It's difficult to say if I feel a difference or not from this supplement. My understanding is that the benefits are seen over a long period of time. This is one of the best prices I have found for high quality Lion's Mane extract, and the extract arrived quickly and in good condition. The Lion's Mane extract has a strong, pleasant earthy flavor. I will definitely be ordering from Nootropics Depot again in the future. Great neuron and memory functions !!! This is an excellent natural nootropic product. Everything came ok here !!! I did not notice an effect at the recommended dosage (1000mg - measured on a food scale) over a few days, mixing with tea or coffee. I began putting using heaping spoonfuls (1000 - 3000 mg) into my drinks and perhaps it gave an effect similar to drinking a cup of coffee after not having any for a couple days. Not a strong effect for me personally. I was interested in this extract after hearing Tim Ferris say it would "LIGHT YOU UP LIKE A CHRISTMAS TREE" on approximately 200 different occasions. I will say that the smell of the extract is pleasant and it had no taste at all. It does not fully dissolve in liquid though, so if you don't continually stir it will all settle to the bottom and make for a chalky last sip.